Robots today can perform space missions, solve a Rubik’s cube, sort hospital medication and even make pancakes. But most can’t manage the simple act of grasping a pencil and spinning it around to get a solid grip. Intricate tasks that require dexterous in-hand manipulation — rolling, pivoting, bending, sensing friction and other things humans do effortlessly with our hands — have proved notoriously difficult for robots. 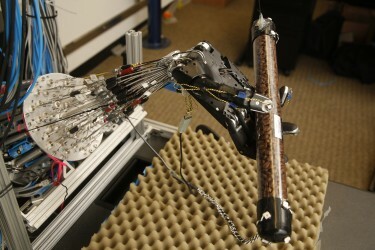 Now, a University of Washington team of computer scientists and engineers has built a robot hand that can not only perform dexterous manipulation but also learn from its own experience without needing humans to direct it. Their latest results are detailed in a paper to be presented May 17 at the IEEE International Conference on Robotics and Automation. By contrast, the UW research team spent years custom building one of the most highly capable five-fingered robot hands in the world. Then they developed an accurate simulation model that enables a computer to analyze movements in real time. In their latest demonstration, they apply the model to the hardware and real-world tasks like rotating an elongated object. This autonomous learning approach developed by the UW Movement Control Laboratory contrasts with robotics demonstrations that require people to program each individual movement of the robot’s hand in order to complete a single task. “Usually people look at a motion and try to determine what exactly needs to happen —the pinky needs to move that way, so we’ll put some rules in and try it and if something doesn’t work, oh the middle finger moved too much and the pen tilted, so we’ll try another rule,” said senior author and lab director Emo Todorov, UW associate professor of computer science and engineering and of applied mathematics. Building a dexterous, five-fingered robot hand poses challenges, both in design and control. The first involved building a mechanical hand with enough speed, strength responsiveness and flexibility to mimic basic behaviors of a human hand. The UW’s dexterous robot hand — which the team built at a cost of roughly $300,000 — uses a Shadow Hand skeleton actuated with a custom pneumatic system and can move faster than a human hand. It is too expensive for routine commercial or industrial use, but it allows the researchers to push core technologies and test innovative control strategies. The team first developed algorithms that allowed a computer to model highly complex five-fingered behaviors and plan movements to achieve different outcomes — like typing on a keyboard or dropping and catching a stick — in simulation. Most recently, the research team has transferred the models to work on the actual five-fingered hand hardware, which never proves to be exactly the same as a simulated scenario. As the robot hand performs different tasks, the system collects data from various sensors and motion capture cameras and employs machine learning algorithms to continually refine and develop more realistic models. “It’s like sitting through a lesson, going home and doing your homework to understand things better and then coming back to school a little more intelligent the next day,” said Kumar. So far, the team has demonstrated local learning with the hardware system — which means the hand can continue to improve at a discrete task that involves manipulating the same object in roughly the same way. Next steps include beginning to demonstrate global learning — which means the hand could figure out how to manipulate an unfamiliar object or a new scenario it hasn’t encountered before. For more information, contact Kumar at vikash@cs.washington.edu.